We really enjoyed chatting with all the Amazon sellers, vendors, and experts we met at last month’s Prosper Show in Las Vegas! Everyone we talked to was super excited about our ASIN lookup tool, ASIN Plus, so we wanted to take a minute to show it to those of you who couldn’t make it to the conference. ASIN Plus is an ASIN lookup tool (sometimes called “reverse ASIN”) for Amazon keyword research that helps you save valuable time – and money. Take all the work that your competitors have done, and use it to your advantage! Instantly access thousands of organic keyword phrases from actual shopper searches that rank top products in your market on page one. You can also see which keywords your own listing is indexing for on Amazon, so you never have to guess how shoppers are finding your product. It’s another opportunity to communicate with your customers by discovering every available keyword. You’ll also have a leg up on your competitors by gaining additional insight into the market and finding new keyword opportunities for you Sponsored Ad campaigns! With ASIN Plus you’ll discover every available organic keyword or phrase that shows the ASIN you’ve searched for on Amazon’s page one search results. It’s by far the most comprehensive view of an ASIN available for Amazon sellers, and we can do this because we know all the keywords that lead to search results. 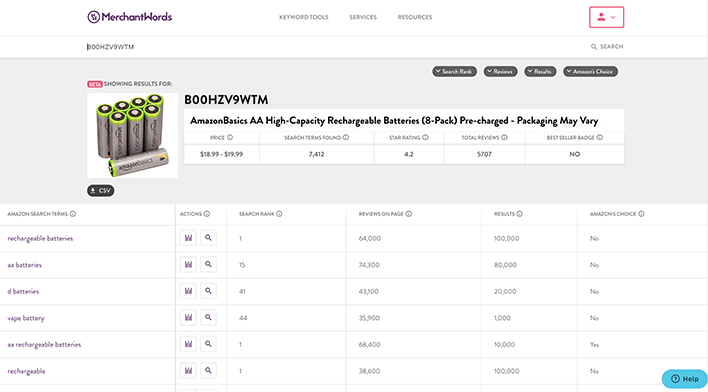 And, for each keyword on the list, you can see a product’s search rank (their position on page one), the number of reviews, the number of competitive product results, and whether or not a product shows up as Amazon’s Choice for a particular term. Uncover your competitor’s keyword strategy, and find new opportunities to optimize your listings and your manual advertising campaigns! You can also drill further into each keyword by clicking on the graph button in the “Actions” column to expand our Keyword History Analysis Panel. This is an incredibly powerful tool that allows you to view a keyword’s trends for the past year, related keywords, and an in-depth analysis of performance metrics for that search term. Additionally, the Page 1 Search Results button will show all the products that show up organically on the first page for that keyword, along with their page ranking and key performance metrics. With all the ASINs in one place, you can easily click on an ASIN to begin a new ASIN Plus search! We read every piece of feedback that ever comes our way, and we take it to heart. When you asked for a reverse ASIN lookup we not only built it, we built it better. With ASIN Plus in your toolset, you’ll reach new customers and gain insights into shopping trends through keywords. With over 1.6 billion unique keyword phrases to date, you’ll find all the search phrases you need to reach a new audience, whether that’s by optimizing your listings or improving your PPC campaigns. Either way, you’ll have more eyeballs on your products. We all know that more traffic + an optimized listing = more sales. Since you never stop striving for excellence, we don’t either. This is just one new feature we’ve added and there’s more to come. 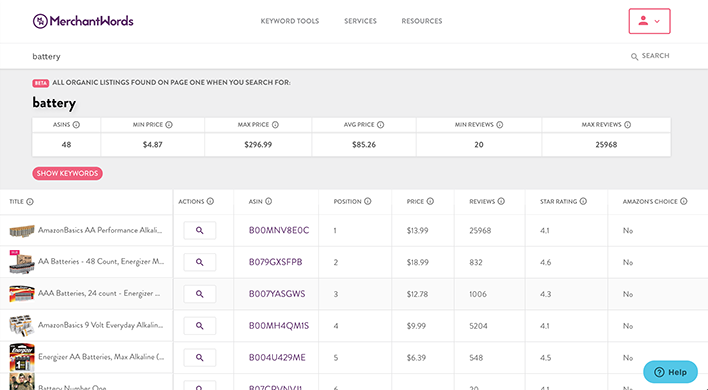 Learn more about our other awesome new developments, including the Keyword History Analysis Panel, and how it can help you drive sales on our blog or YouTube Channel! FINAL NOTE: ASIN Plus is currently only available for Amazon US, but we'll be rolling this data out to other countries very soon. Which country should be next? Email us at [email protected] with your vote!